News that the Hoopoe that I saw in Hamworthy in February was still about and within the Lytchett Bay recording area had me searching the area, to no avail, on the afternoon of the 19th. It is clearly covering a wide area and is very difficult to track down, as it spends most of its time in private gardens. A stop at Monkeys Jump just west of Dorchester produced a singing Corn Bunting but little else in the bitterly cold wind. From Portland Harbour eastwards the Fleet runs some 15km to Abbotsbury. This partially tidal lagoon is separated from the sea by the shingle bank known as Chesil Beach. Formed by the process of long-shore drift, the pebbles are larger at the Portland end than the Abbotsbury end, so consistent is this that it is said that smugglers of old knew exactly where on the Chesil they had landed by the size of the pebbles. Viewing the lagoon at the west end of the Chesil can be tricky. There are three options, viewing from the road that runs past the Swannery (distant and often into the light), entering the Swannery itself (best views, but expensive and closed in winter) or walking along the shingle to the war-time tank traps (tiring, distant and often looking into a cold wind). I chose the latter and after a short while had reasonable views of nine Scaup and three Long-tailed Duck amongst many commoner wildfowl. The war-time tank traps, designed so that if the enemy landed on the Chesil they could not make their way inland. Beyond is the western point of the Fleet with Abbotsbury Swannery in the background. Further east the shingle bank continues another 5km to Cogden Beach, although it now does not enclose the Fleet. A mere at West Bexington is a well-known hotspot for birds and I headed there next. My main target was a Snow Bunting that has overwintered on the shingle but in spite of searching for some time I drew a blank. it has not been reported since, so perhaps after a stay of four months it left just before I visited. The Mere at West Bexington. Note how fine the shingle pebbles are at this, the western end of Chesil Beach. During the evening I gave a talk to Sherborne Dorset Wildlife Trust on New Guinea and on the 21st the Dorset Bird Club had its AGM in Wareham. Mark Constantine gave a very good talk based on his recent book ‘Catching the Bug’ about birds and birding in Poole Harbour. Mark gave an excellent talk at the Bird Club’s AGM. With some quality sound equipment provided my Simon Emmerson off the Imagined Village (at back centre) Mark demonstrated the bird soundscapes of Poole Harbour to a capacity crowd. Much of the weekend was spent around Holes Bay. In spite of the cold conditions there was an appreciable arrival of Chiffchaffs. Shaun, Terry, John and myself tried ringing by the drain at PC World, the site where we have been looking into over wintering Chiffchaffs. We retrapped four wintering birds, caught one control (a bird previously ringed elsewhere) and ringed some 68 new Chiffchaffs as they moved along the drain (the outflow from the nearby sewage works) feeding on the waters edge and the nearby bushes. The most interesting bird was a Chiffchaff of the Siberian race tristis. We have caught a few candidate tristis over the winter but this looked the real deal. Shaun has been licensed to collect a tail feather from such birds for DNA analysis and we look forwards to the results. After months of ‘is it or isn’t it’ this was an undoubted tristis (unless the DNA says otherwise!). Pure grey and white except for some green fringing to the outer webs of the primaries ……. … and just a hint of yellow at the bend of the wing. The fine wing bar caused by tips to the greater coverts would have abraded away by this time of year. The key identification feature of tristis is the call but they are invariably silent in winter. We were interested to see how many of the Chiffs remained and how many had moved on, so Shaun and I, along with Simon and Sean were back on at PC World drain Sunday morning (in spite of being tempted by the presence of a Bluethroat at Portland). We caught 12 new Chiffs and 13 retraps showing that in spite of the cloudy conditions many had moved through but still a some remained. Another dull Chiff was trapped but it was not as good a candidate for tristis as yesterday’s bird. A group of ten Sand Martins fed over the drain and later I found a group of six Wheatears along the verge at Holes Bay, showing that in spite of the cold, Spring isn’t far away. Although still lacking any green except on the outer webs of the primaries, this bird (captured on the 24th) is much darker on the breast. The tail was very abraded. Tristis has been mooted as a distinct species, but establishing criteria to distinguish all individuals on plumage alone from the Scandinavian race albetinus is proving challenging. The use of a standard grey card as a background is making it easier to evaluate these photos. The afternoon was taken up with the last WeBS count (waterbird survey) of the winter season and it felt much colder than those counts actually done during mid winter. With much of the country likely to endure a ‘White Easter’, Margaret and I are heading for warmer climes. More to follow on our return. I have been having some difficulty with the Wildlife Recorder program (I am also having some difficulty with the format of this blog post!!) that I use to manage all my wildlife sightings. It was suggested that I delete and re-install it. On doing so I was invited to use a ‘validation program’ which checked the location of each record against the known range of the taxon concerned. It quickly came up with 12 pages of errors amounting to over 500 sightings. Most of these were down to vagrants and rare migrants, for example WR didn’t know the Common Yellowthroat occurs in Wales, in some cases (especially wagtails) it didn’t like the subspecies I had chosen, some because I had given the location of a trip that crossed faunal zones without splitting the sightings into those faunal zones and some were just silly mistakes. Examples of silly mistakes included White-throated Treecreeper (Australia) entered as White-throated Treerunner (South America) or Long-legged Pipit instead of Long-billed Pipit, but others were due to me entering a name that was in use for more than one species at the time without being aware of that. An example would be ‘Red-capped Parrot’ in Argentina which was entered as the Red-capped Parrot that occurs in western Australia, the south American bird is now called Pileated Parrot. 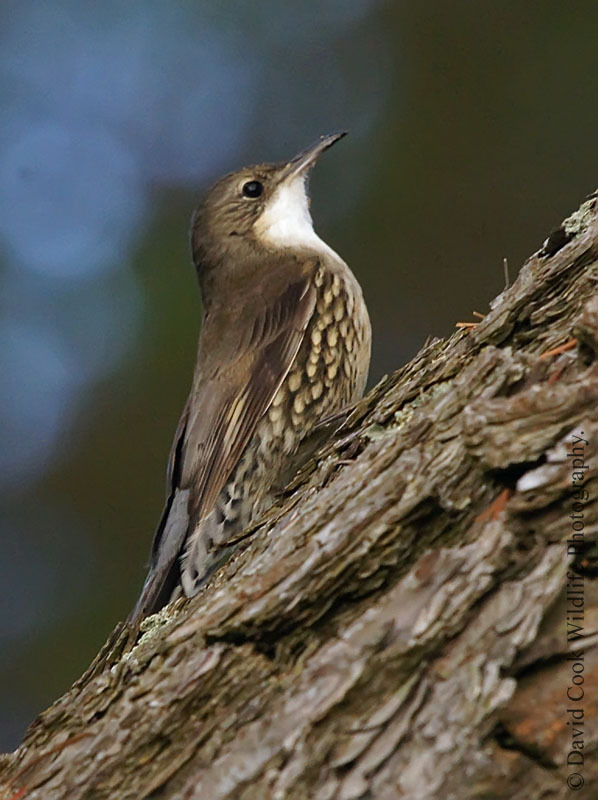 White-throated Treecreeper (top) of eastern Australia may look like and have an English name that is very similar too White-throated Treerunner (bottom) of southern South America but they are not even closely related. Is this an example of convergent evolution of vernacular names? Both images from the internet. This underlines the necessity for a single unique English name for every bird species in the world (which now has been achieved) and the careful observation of the scientific name whilst entering data. My early write ups and checklists from tour companies in the 80s and early 90s didn’t use scientific names and this is where the majority of errors occurred. As yesterday progressed my office desk, then the floor, filled up with dozens of old checklists, write ups, notebooks, field guides and volumes of HBW until I could hardly get out of the room. It took 12 hours at the PC but I’m glad I straightened out the database. OK I lost a few lifers but gained some as well, in the end I lost just 0.17%. On the 13th John Dowling and I continues the ringing program at Holton Lee. As before there few new birds, a Great Spotted Woodpecker was an exception, but we had lots of retraps so the data keeps accumulating. Pheasants are common around the feeders and we have to be careful not to spook them to keep them out of the nets. Introduced to Britain from Asia in Roman times, millions are released every year for shooting. On the 14th I did a high tide waterfowl and wader count at Lytchett Bay for the RSPB as the usual surveyor, Shaun was abroad. The tide was very high and many of the fields were underwater. There were no particular surprises but it was a nice sunny and warm morning to be out birding. inlet on the left is the footpath! On the seaward side of the sluice gate, the water forcing its was through the gate had built up so much pressure that a whirlpool was formed. saw also them in 2006 on one of first dates so it was great to hear them again. On Saturday 16th we had a lot of friends round for nibbles and drinks, mainly ex colleagues and partners and family. It was a most enjoyable evening as we all crammed into our conservatory. On Sunday Margaret and I spent the afternoon near Sixpenny Handley where Merlin and Hen Harrier showed distantly and Short-eared Owl and Great Grey Shrike showed quite well. Later we were invited round to our friend Christine’s for the evening. and friend Lilly were about somewhere. Short-eared Owls have been easy to see at Wyke Down this winter. Since I got back from Colombia I have been busy editing photos of the trip, posting accounts on the blog, preparing for our upcoming trip to Israel as well as getting out and doing a little birding and ringing etc. What I haven’t been doing is updating the blog with what’s been going on at home. Now’s the time to catch up. On the 26th Feb I gave my ‘Lands of the Queen of Sheba’ talk to the Anglo-Italian Society. Whilst the links with Italy were tenuous in the extreme, they seemed to enjoy it. The photo shows the remains of the Grand Stele at Axsum. At 32m high it was the largest stone monolith ever erected. We had a very busy time over the weekend of 2nd and 3rd March. All the family went down to Swanage to attend the Blues Festival as Kara had heard there was an open mike session in one of the pubs. Most musicians sang stand blues numbers……..
… but Kara sang a couple of her own compositions unaccompanied, including the lovely ‘Misty Blue’. She got a great round of applause and was invited back to sing on the Sunday. In the evening Margaret and I went to a totally different type of musical event, the Moscow City Ballet’s performance of Sleeping Beauty at Poole Lighthouse and very elegant it was too. Early in the morning of Sunday the 3rd I went to Paul’s house to do some ringing. He has had a large number of finches moving though his Lytchett Matravers garden. This is a male Redpoll in full summer plumage. The white tips to the outer greater coverts on this Siskin indicate that it is a first year bird. After a spot of lunch we returned to Swanage to hear Kara again. This time she was joined by her friend Lilly and together they sang an Adele song …. They looked pretty pleased with themselves, even though Lilly admitted to being rather scared. We didn’t stay at the pub after Kara had done but headed to Middlebere where a Green-winged Teal had been seen. 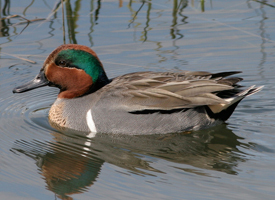 This is the North American equivalent of our Eurasian Teal and differs in the vertical stripe on leading edge of the flanks and by the lack of yellow margin to the green eye patch. Views were a bit distant but adequate through the scope. Later we had the whole family round for a meal, ending a busy but enjoyable weekend. Green-winged Teal. Photo from the internet. With Shaun away in India it fell to me to try to continue our wintering Chiffchaff ringing program near PC World. I visited with trainee John Dowling on the 4th but we only caught retraps. However one bird was of note, a Chiffchaff ringed in January 2012 giving our second record of winter site fidelity. 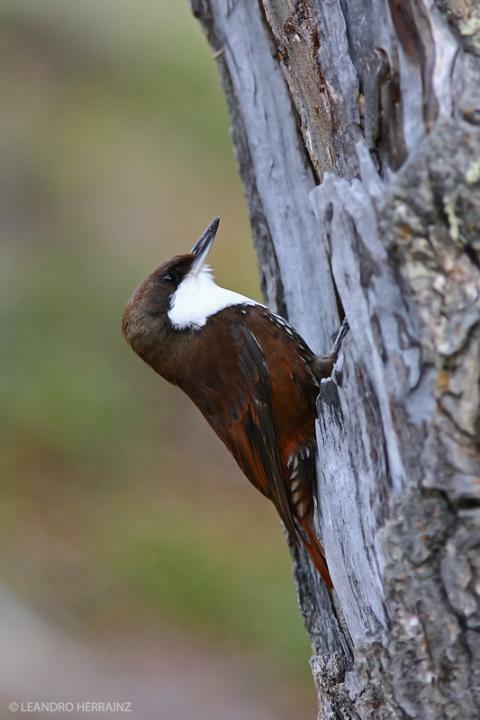 Site fidelity of breeding birds is well documented but there are far fewer records of migrant birds wintering in exactly the same place in subsequent years. A typical colybita race Chiffchaff, the common breeding form in western Europe. Although migrant breeding Chiffchaffs arrive in March, at the start of the month this is most likely a wintering bird, a fact backed up us capturing it in January 2012. Taking advantage of the improved weather I visited Holton Lee to continue the winter ringing program. Now nearly all the birds coming to the feeders have rings on them. This will allow some interesting data to be compiled on site fidelity, longevity and population dynamics. Not all birds can be ringed. There is an absolute ban on ringing Pheasants, a) because as most are released for shooting they actually belong to someone, and b) a ring might cause damage to the spur on the tarsus. They have a nasty habit of flying through mist nets leaving a gaping hole but fortunately this bird didn’t cause any damage. Another bird that could not be ringed. Finches, especially Chaffinches suffer from a mite infection which produces this ‘scaly foot’ affliction. It is common in some cage birds and has been linked to a Vitamin A deficiency. Apart from a nice get together with birding friends down the pub I didn’t get out much for the rest of the week. Cold weather and ongoing problems with my foot and a new cold kept me at home. Disappointed by the quality of the photos I took in Colombia with my old Lumix camera I decided to replace it with a Canon Powershot HS50, the camera that Ed Wilson used (see previous post). It arrived towards the end of the week, so we went up to Wyke Down on Saturday afternoon to try it out. The day was very dull and grey, but that was OK as I wanted to see how it operated in low light. The road between Wimborne St Giles and Wyke Down is still flooded in places. When this Barn Owl appeared I had no option (other than step out into ankle-deep water) than to stop in the middle of the road and photograph through the passenger side window. Results weren’t too bad though. This Short-eared Owl was photographed about 100 yards away at 1/20 of a second and a focal length of 1200mm. The image stabilisation on this camera is remarkable. Undoubtedly I will get better photos with my Canon SLR, especially of flying birds, although the focal length is only 400mm and the weight is five times as much which makes a huge difference in hot or humid conditions abroad. Sunday 10th was Mother’s day and Anita and John invited us all round for a delicious lunch. This must be the first year for decades when Margaret has been able to spend Mother’s Day with both her daughters. A Mother’s Day treat for Margaret. The Colombia Andes are divided into three distinct ranges divided by the narrow Cauca and the wide Magdelena valleys. Most of the birding on this trip was on the eastern cordillera, then we crossed the Magdelena valley to reach Medellin on the central cordillera Later we flew over the western cordillera to reach the coast. Now we drove from Medellin across the Cauca valley and up into the eastern cordillera for our last location on this tour. We stopped in the valley to look for a species that was only described in 2012, the Antioquia Wren. We heard the wren OK and saw it fly across the road, but we came away rather disappointed. We arrived at the picturesque town of Urrao after dark. We left most of gear at the hotel and took just a few things for our night on the mountain. It was still dark the following morning when we set off on mule back for the mountain lodge. 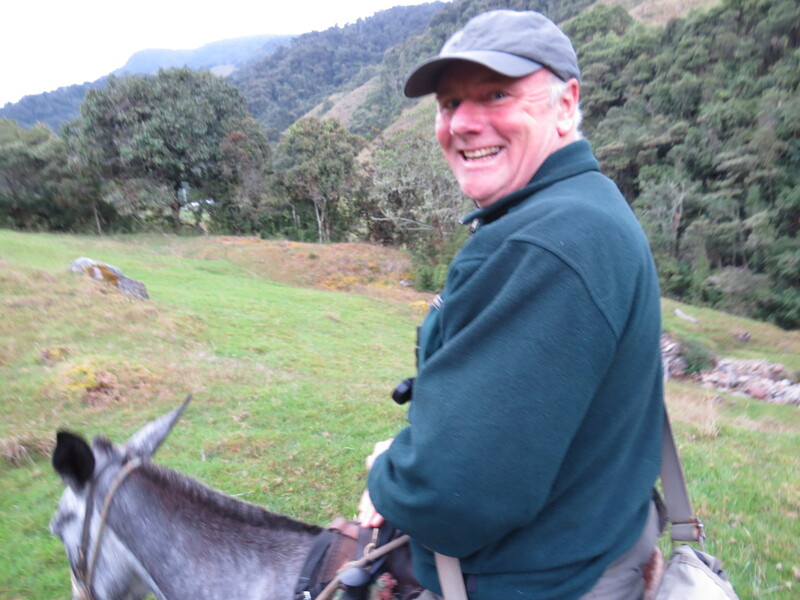 We had wonderful views from the lodge which was 600m above our starting point …..
… but this was the first time I have ridden a horse or mule since I was a kid and it was hardly the most comfortable of experiences! Photo by Ed Wilson. After a stop for breakfast at the lodge we climbed a further 400m on mule back. … before ascending the last 200m to the treeline on foot. The paramo was covered with espeletas. Unfortunately Beaded Helmetcrest has not spread this far west, but we did see three specialties, Chestnut-bellied Flowerpiecer, Paramillo Tapaculo and Dusky Starfrontlet, lifers for all of us and new for the Birdquest life list. …. however Pro Aves the conservation society that own the site named it as Fenwick’s Antpitta Grallaria fenwickorum after the organisations benefactor George Fenwick. The near simultaneous naming of the species by two different parties under acrimonious conditions has created a bit of a scandal in the ornithological world. This was to be my last new bird of the trip, although a stop in the Cauca valley did give us good views of the Antioquia Wren. From here we walked down to meet the bus and drove back to Medellin to catch the overnight flight to Madrid and then to home. It had been an excellent trip with 56 life birds out about 600 recorded. Of course I didn’t see all that I hoped to, much of Colombia is poorly known ornithologically, as can be seen by the number of species new to science that are being discovered there also this was the first time that this itinerary had been followed in full by Birdquest, as the last tour was severely affected by weather causing cancellation of flights to the coast. Of course after 13 visits to South America I’m very much searching for specialties and almost by definition, specialties are hard to see, either because they are rare, elusive or their locations are difficult to access. Of course there were some problems, in some places rain hindered our birding, but in others it was too dry and birds weren’t singing. Logistically it went very well but there were still some dreadfully long drives, however things should improve when the new roads, currently under construction, are opened. However the biggest issue was the situation with Roger, who remains very much in our thoughts. PS Whilst completing this entry I received a lot of photos from Ed Wilson which were far better than mine. I have replaced my old Lumix camera with the Canon Powershot SX 50 HS that he used, more of that later. I hope to post a few of Ed’s pictures as soon as I have had time to review them. With Roger now in hospital, it was a small group of three punters and the leader that flew from Medellin to Bahia Solano on the Pacific coast, just south of the border with Panama. On arrival we waited at the little airport whilst a rather ancient vehicle with dodgy brakes arrived. We drove the 12km, the last mile of which was along along the beach, to the lodge where we were made very welcome. This area is quite unlike the rest of Colombia, very laid back with a predominately black rather than hispanic population, indeed the vilage of El Valle near the lodge reminded us of an African rather than a Colombian village. We did some birding on route and again along the road in the evening. One of our main targets was the little known Baudo Oropendola which is occasionally seen in the area, we had unprecedented success with a total of 22 that day. Much has been made of the Birdquest Life List recently. This, the total number of species recorded on all Birdquests combined, has to be the biggest list of all (except of course the list of all the birds in the world) and currently stands at 9910 out of a total of 10466. We added at least six birds to this during the trip and Baudo Oropendola was one of them. The following day we set out at dawn in a boat to bird in the Utria National Park. It was a very dull and grey day and as we entered the forest it seemed almost like nighttime. We were crossing a narrow peninsula and eventually we arrived at the narrow inlet on the other side, which strongly reminded me of a Scottish loch on a winter’s day. The boat had gone round the peninsula to meet us and transferred us across the loch to the park HQ. On arrival at the coast we soon found some extraordinary large insects, this cricket was seen whilst we relaxed with a coffee by the airport. Locals realised these weird foreigners were interested in bugs as well as birds and soon rustled up this giant beetle for us. Eventually our transport arrived, it had virtually no brakes but then there was virtually no traffic on the single road and we only had to travel 12kms. Although it was hot with 95% humidity on the coast, our stay at the lodge was very pleasant. This coastal area known as the Choco has one of the highest rainfalls on the planet, between 8 and 13 meters per year! Fortunately it was mainly dry, albeit cloudy during our stay. Our tour leader, Eustace braving the surf in the bow of the boat. Once ashore we crossed the peninsula on narrow forest trails. On such a dull day there was little bird activity. A Colombian sea inlet or a Scottish loch in winter, the presence of palm fronds in the upper left gives away the true identity (as did the 30 degree heat). As we ate our lunch it poured with rain but then the skies cleared. This impressive boardwalk through the mangroves has just been completed and allowed easy viewing of Sapphire-throated Hummingbird which is normally a sod to see. We really could have done with a dawn visit to the boardwalk, accommodation at the park HQ is currently being built and it is likely that future tours will spend at least one night there. This large spotted ray could be seen swimming under the boardwalk. Beyond the boardwalk progress though the mangroves was slow, hot and muddy. Unfortunately before we left the following morning I stumbled into a concreted drainage ditch in the dark and hurt my foot which remains swollen to this day. This was tricky as we had a 9km walk along a trail to the National Park which proved to be a very uncomfortable experience. Again birding was fairly quiet but we scored with the beautiful Scarlet-and-white Tanager and elusive Spot-crowned Antvireo, but that taxonomic anomaly, the Sapayoa was only heard. There were at least 35 life birds for me in the area but I only saw 15 but everyone finds birding the Choco tough. Fortunately we didn’t have to walk all the way back as the boat picked us up from the head of the sea loch. The view from the lodge in the evening. The final morning was pretty wet and we didn’t see much but the little plane arrived on time to take us back to Medellin. Leaving Ocana we drove south through the Upper Magdelena Valley. Much of this area is given over to cattle ranching but there are a few roadside marshes. In the late afternoon we turned off the main road and headed to the El Paujil reserve stopping a number times. The strange Donocobious has changed its affiliations as often as Italy has changed governments. Once included with the mockingbirds, then the wrens, it is now placed in its own family. Northern Screamer is restricted to a small area of northern Colombia and neighbouring Venezuela. It is the last, and by far the rarest of the three Screamer species to be added to my list. Eventually dusk fell and we had to leave the open meadows and drive on to the El Paujil reserve. We spent two and half days at El Paujil. The days started with a wade across the river followed by a 300m hike up the hill. Soon we were getting good views over beautiful primary forest. It was quite warm and very humid and I found climbing the hill a bit tough. This strange lizard was seen near our chalet. There were plenty of moths around including this beautiful hawk-moth. By far the best bird was the critically endangered and seldom seen Blue-billed Curassow. We had great views of a group of two males and two females on our third and final morning. This bird however is held for a captive breeding program, which at the moment is doomed to failure as they only have three females. Roger Clifft relaxing (and fooling about) in a hammock.. Although 75 years old Roger was extremely fit and even used to go jogging at lunchtime in spite of the hot and humid conditions. However not long after leaving El Paujil he suffered severe abdominal pains which was eventually diagnosed as peritonitis. A visit to to a small hospital at our next stop in Libanon failed to diagnose the problem and he left the tour when we arrived in Medellin and he remains in hospital there today. Roger was great company and a really nice bloke to be on tour with. His illness cast a long shadow over the trip and we wish him a speedy recovery and return to the UK.